The oatmeal bath bomb is very nice. Smells nice and leaves a silky feeling to the skin. But the price is outlandish for 1 bath bomb. I will not be repurchasing until the price drops. 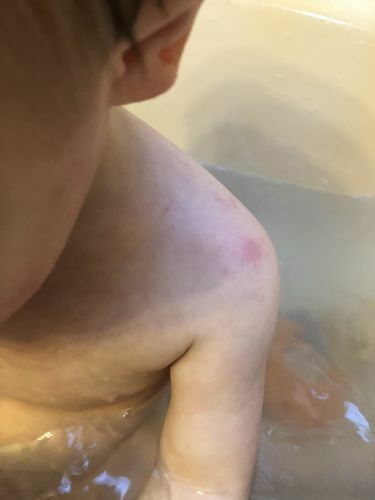 My son has had eczema issues from as young as a year. I tried every product I could find to offer him relief. One bath with the oatmeal bath bomb coupled with the honey cream cleared it up overnight! I recommend this to everyone I know that suffers from eczema. Thank you for creating such an excellent product. The bath bombs are wonderful! Softens the water & feels silky on the skin. Wish they were about half the size though & not so expensive. Is there any way to cut them in half? Other than that I think they are great! My son has bad eczema. The bath bombs help take the iches out so a good nights rest can happen. The wipes help with day time irritations. And the cream helps heal the cracks and crocodile skin. Stay persistent in application and the results happen. Makes me feel better because the amount of topical steroids he was prescribed made me uneasy and didn't have the same healing effects.